As the name implies Bee Dry helps leather resists penetration of water. 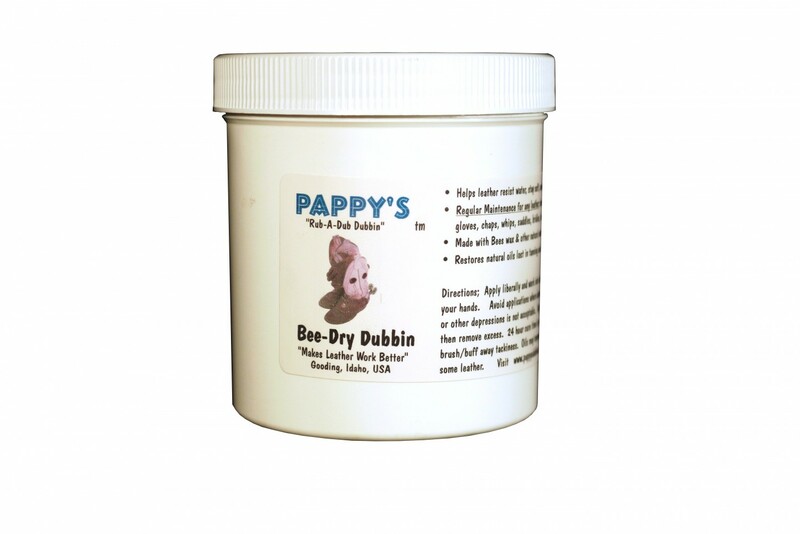 It is the only Pappy’s Dubbin product that does repel water. I have tested it for several years now, and it definitely helps prolong the life of leather exposed to moisture; as compared to other leather products I have used in my comparisons. It is made for boots, gloves, chaps and other things that are rained on or get wet from morning dew and everyday use. I use it on saddles for back cinch straps and latigos, for the back side of the fender and stirrup leathers that comes against the horse, and for saddle strings that get wet from sweat or rain. Another use is for lubricating a cantle binding where the rope rubs, or the swells where the rope rubs, it helps the leather stay soft and move under the rope and helps to keep from being so worn off from the abrasion. I have tried to keep the oils down so the leather doesn’t get soggy or sticky. With all of these products if you get it in the tooling use an air compressor or brush and remove it before it sets up in the depressions. It polishes very well. It is slow drying but repels water good. I would hate to be without this fine product. It may need to be applied weekly, more or less, on heavy use leathers like boot or chaps, which are exposed daily to rain, wind, dirt and water.